Good job emptying these, but … now what? 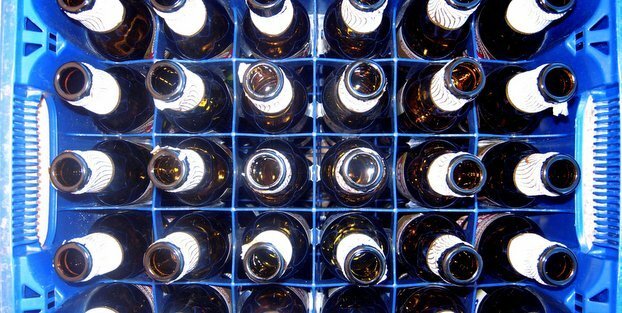 The Glass Packaging Institute (GPI), along with beverage leaders including Diageo and New Belgium Brewing Co., and the glass processing and recycling industry, have convened a dynamic group of organizations to make glass recycling work in the United States. The nearly two dozen member organizations announced that they are joining forces to create the U.S. Glass Recycling Coalition. The coalition’s primary goal is to help build a foundation to make glass recycling a successful industry, and an efficient, high-quality and convenient service consumers want and expect. An extraordinary aspect of this coalition is the fact that it involves membership and collaboration across the entire glass supply chain. For the first time ever, organizations, including consumer brands, glass manufacturers, waste haulers, recycling processors and trade organizations involved within many of these industries, will work toward this common goal. Glass containers for food and beverages are 100 percent recyclable, but today the U.S. recycling system faces a perfect storm of economic forces that is making it harder to recycle glass. Glass recycling can pose unique challenges on the recycling infrastructure if not planned for and executed correctly. In addition, a few municipalities have decided to remove glass from their curbside recycling programs and send it to disposal instead. This trend is not only environmentally harmful, but also serves to disengage and confuse the public on recycling. Making Glass Recycling Work Coalition members intend to work on bringing best practices to the U.S. glass recycling supply chain to increase the availability of “cullet,” the industry term for furnace-ready recycled glass that can become new bottles and jars, as well as fiberglass. For companies like Diageo and New Belgium Brewing, glass is not being recycled at a high enough rate to meet the beverage makers’ needs for recycled glass to make new bottles. Sarah Marie Wood liked this on Facebook. i know! I saw this!